On From 9 a.m.to 2.p.m. 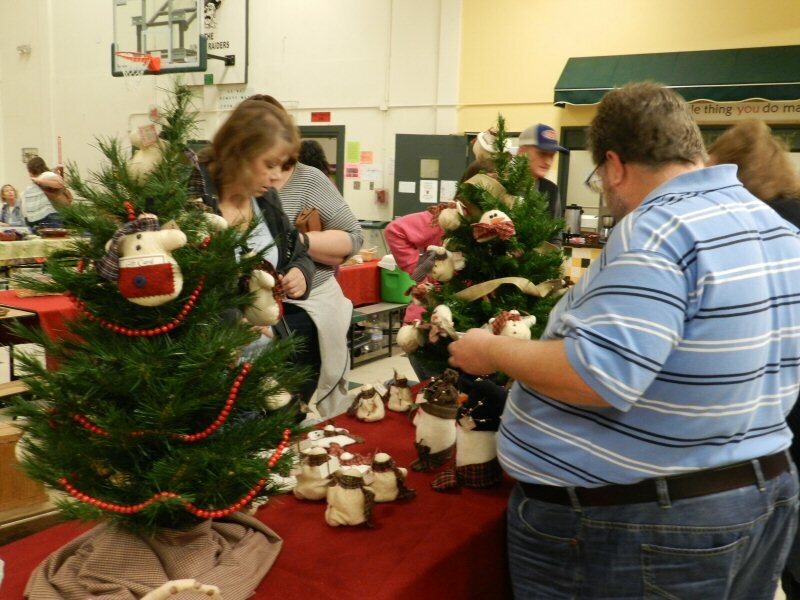 on November 21, there was a steady flow of happy shoppers streaming through the Annual Homemade Craft Fair and Soup Café held by the Burney Elementary PTA. 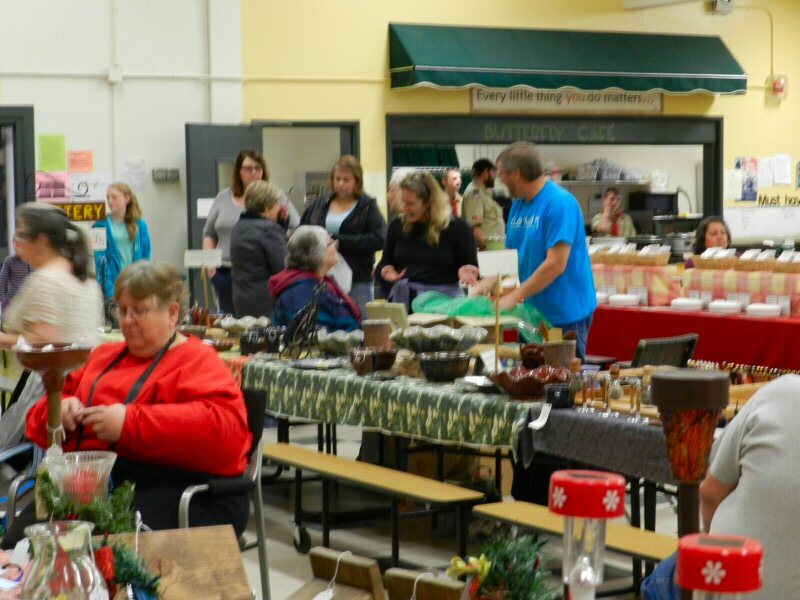 It was a community affair with everyone enjoying the opportunity to stock up on delicious goodies for Thanksgiving as well as high quality crafts and decorations for the holiday season. 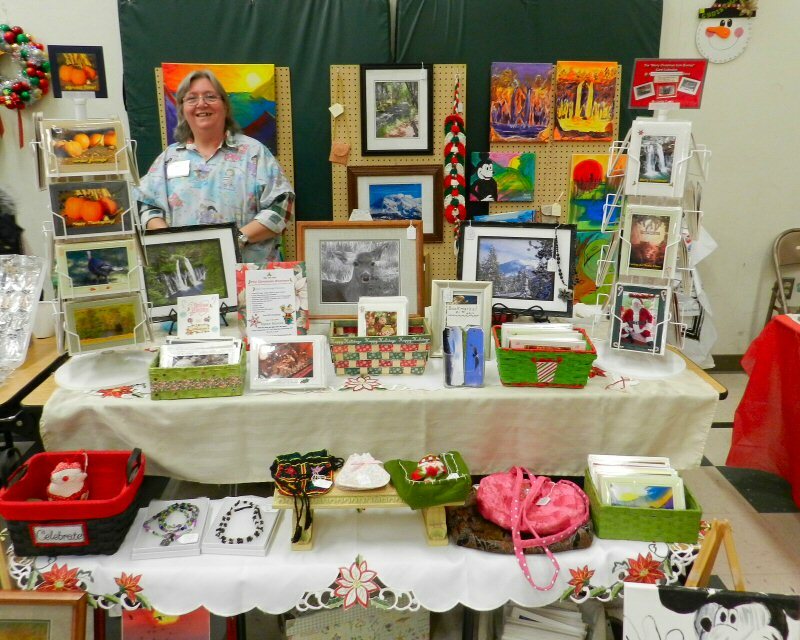 This years fair was organized by Kathy Urlie. She did a great job. All of the tables were filled and everything ran as smoothly as Santa’s sleigh gliding down a snow covered mountaintop. 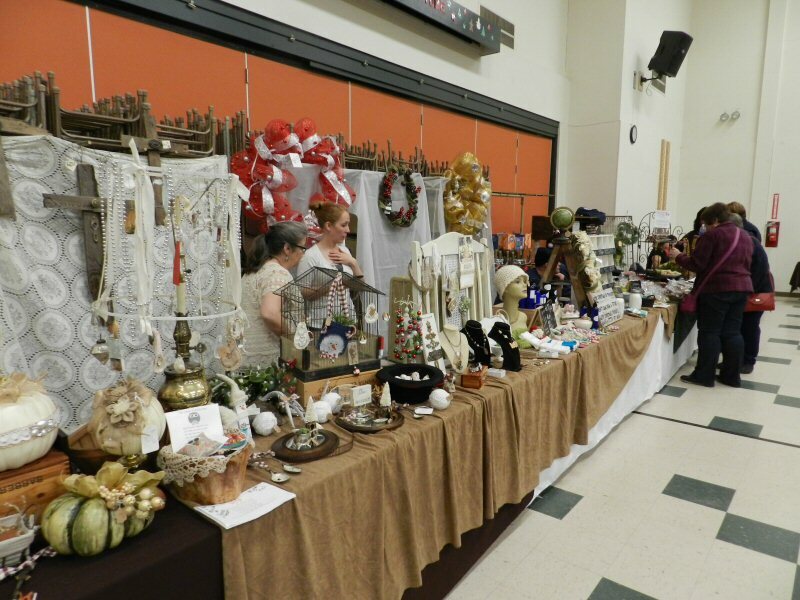 During the event itself she was busy cheerfully greeting guests and vendors and making sure that every one was happy. In the meantime, her husband Andrew was busy selling his wonderful art pottery. Special thanks to the Boy Scouts Troop 38. When my wife Linda and arrived on Friday evening to set up, several of the Scouts helped us to unload our vehicle and carry things in. 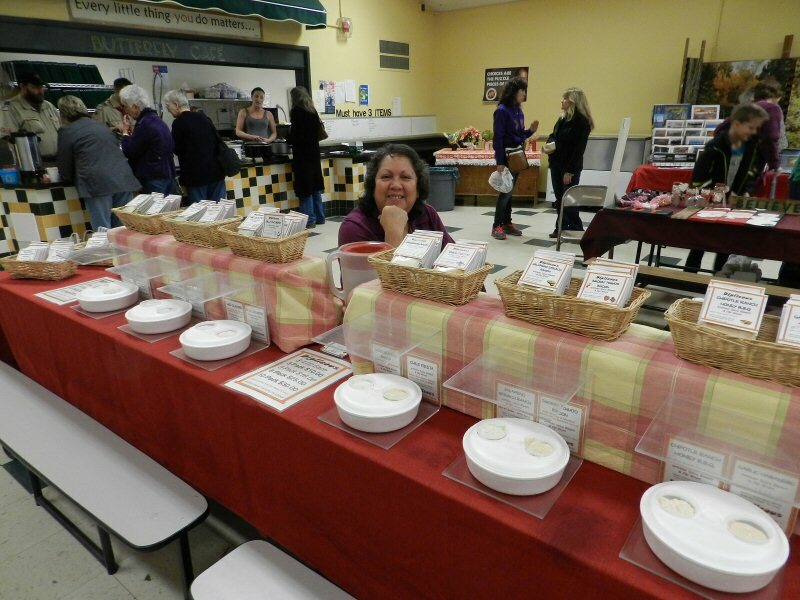 It was a great help and made setting up much easier and quicker. 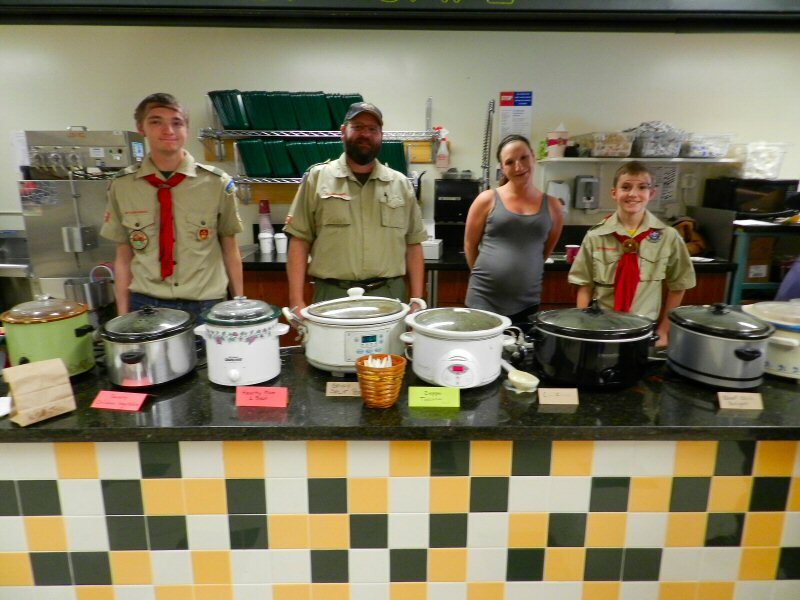 On Saturday, Scoutmaster George Chapman, Scouts James Chapman and Matt Golczynski, and Melissa Sweet served delicious homemade soup. I had a bowl of clam chowder made by Matt that was really super! Nice and thick with lots of clams and bacon, just the way I like it. For people who like spicy soup, Melissa brought a pot of soup seasoned with red pepper that was great for clearing the sinuses. 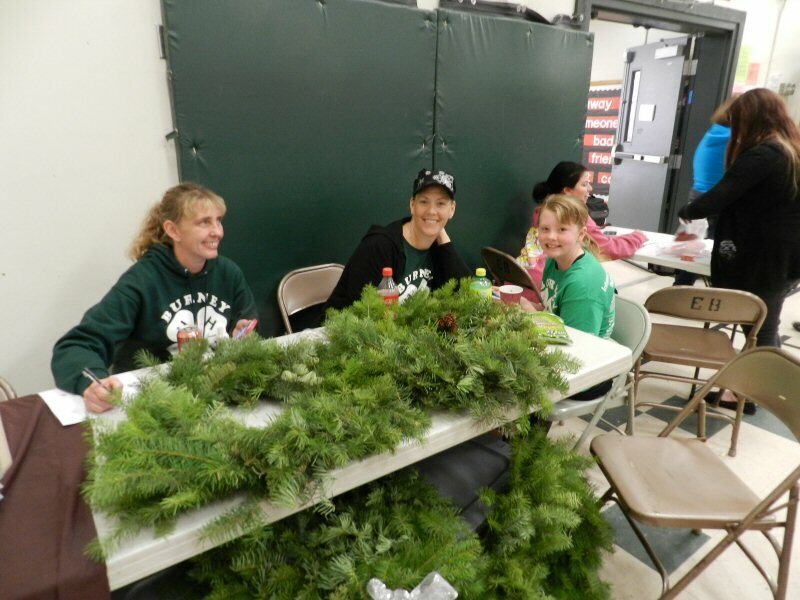 The Burney 4H was there selling Christmas Wreaths and the Soroptomists had some wonderful baked goods. 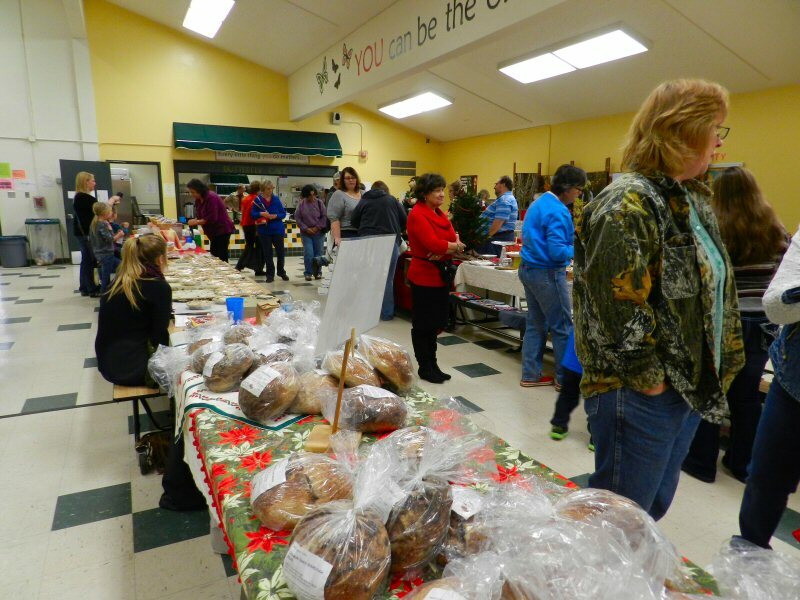 The Burney Fire Department also had baked goods available for a donation to their Christmas Toy Drive. I donated for two little loaves of bread – one pumpkin and one cranberry nut. The cranberry nut bread was out of this world! What a treat! I think I’ll go have another piece for breakfast! The Maupins brought breads, and others had pies, cakes, etc. I would have bought more, but just the day before I had bought a carrot cake and brownies from the Lionesses outside of the Dollar General Store. One can only eat so much. Lead me not into temptation. Deliver me from gluttony. Susan Hougan came down from Mt. Shasta to sell her delicious herbs. She said she likes to come to the Burney area for events. People were lining up for pretzel sticks to sample her fare. Well, as you can see, I like food. 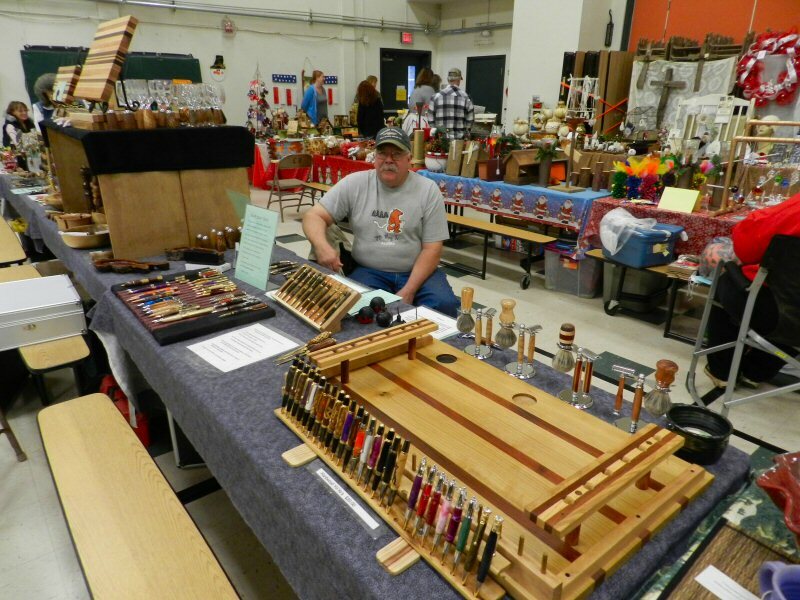 But the highlight of the fair was the wonderful high quality crafts. 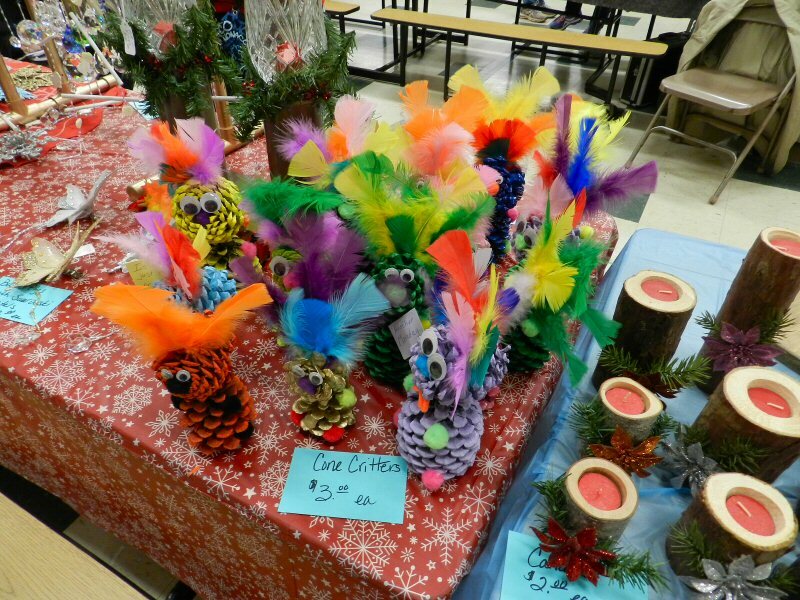 There were many Christmas crafts and decorations and also really wonderful art crafts. I already mentioned Andrew Urlie’s art pottery, which is becoming quite well known in the area. 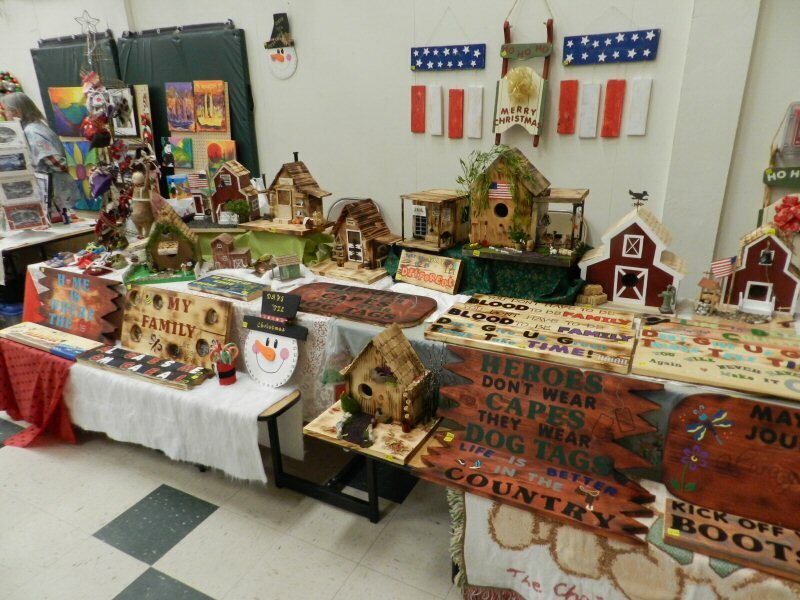 Something new this year was a collection of bird houses by Eileen. And it is always a treat to see what new items the McKay brothers have created out of natural substances. I’m fascinated by their horse manure pens. Michelle was there with her country chic creations. 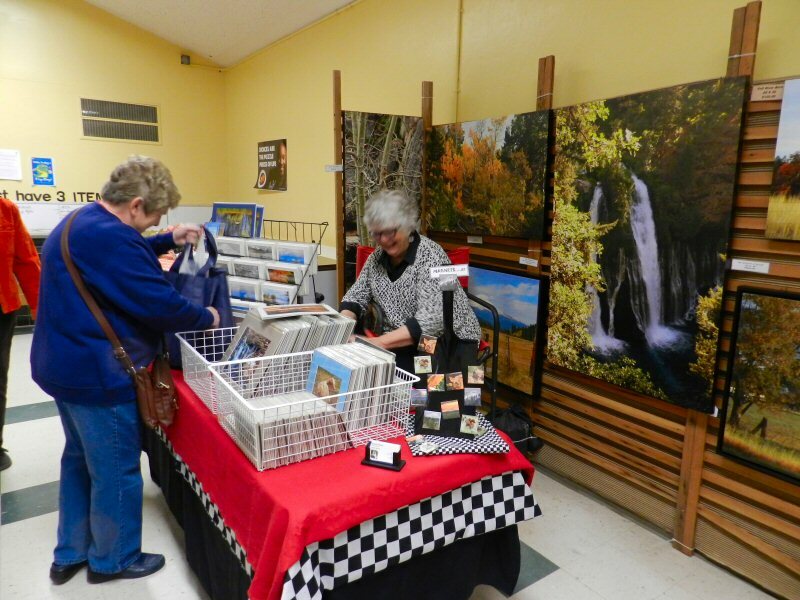 on the other side of the hall, my wife Linda was busy selling her hand-crafted Christmas cards, framed photos, and some of my paintings. Linda also handed out flyers letting folks know that this year there is a Christmas Shop in the Hearthstone Health Food Store where people can get more gifts, stocking stuffers, hand-made crafts, as well as Christmas decorations and cards. Well, that’s a glimpse. There was more. Hand-made goat soaps, candles, wooden toys, Christmas crafts, jewelry, etc. Plus it was a chance for friends and neighbors to see each other and share fellowship.